For me these were my favourite part of the cake theme, so many cute owls surrounding the cake, and they were fun to make. They also ended up being a top favourite "how to" activity at my community hobby workshops last year. 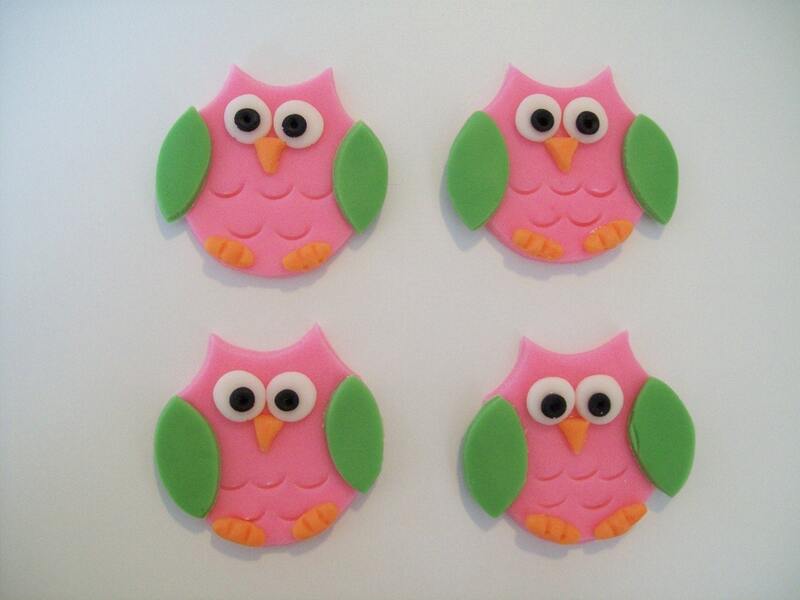 I was inspired by these owls at Cake Decorating Trends, but I wanted something that I could get away without having to buy a special cutter. (You all should know by now that I love saving money!) So in the end I tweaked the idea a little more and chose a round cutter. I think the design still came out just as cute. I also decided that love hearts would make for a better beak, and in the midst of it all, found it easy to use hearts for the feet tucked underneath the body. #1 Dry the wings, feet, and the body shape separately over night to ensure you don't get a buckle or bend in the wing shape. #2 Ensure that you dry them on a flat surface. Optional - White edible paint to dot wings. 1. 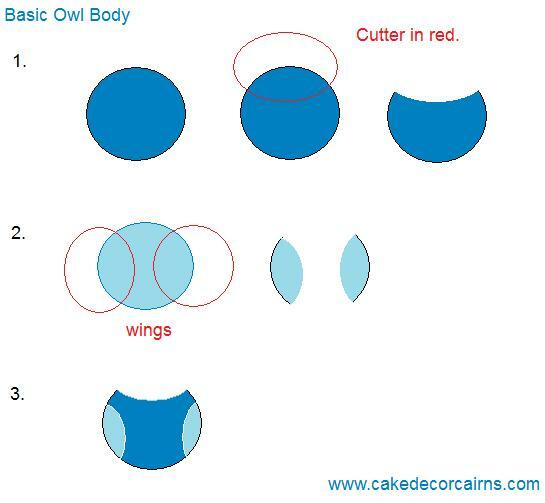 Cut out body circle in chosen colour, then cut a "crescent" at top to make owl head shape. This is a quick and simple method to make an owl without having to buy a special cutter. Whilst the fondant is still soft, use the edge of a piping tip to create semi circle shaped indents into the belly region to represent feather ruffles. 2. Cut out more circles in chosen wing colour, and cut out two crescents per circle. 3. The diagram shows how the crescents attach as wings once dry. #Optional use edible paint to dot the wings. 4. Cut out several Orange mini love hearts - I cut out loads and loads because I could not be bother counting, and besides, you can always use them for something else later. 5. For the eyes, cut out small white circles, I found my smallest circle cutter was still not small enough for the black of the eyes so I used a small round piping tip. 6. Once you have all these pieces, and they are dry, it's pretty straightforward looking at the picture to guide you how to glue it all together. But if you have any questions please ask away. I used CMC glue sparingly, to attach everything. So there you have it! Part 2. 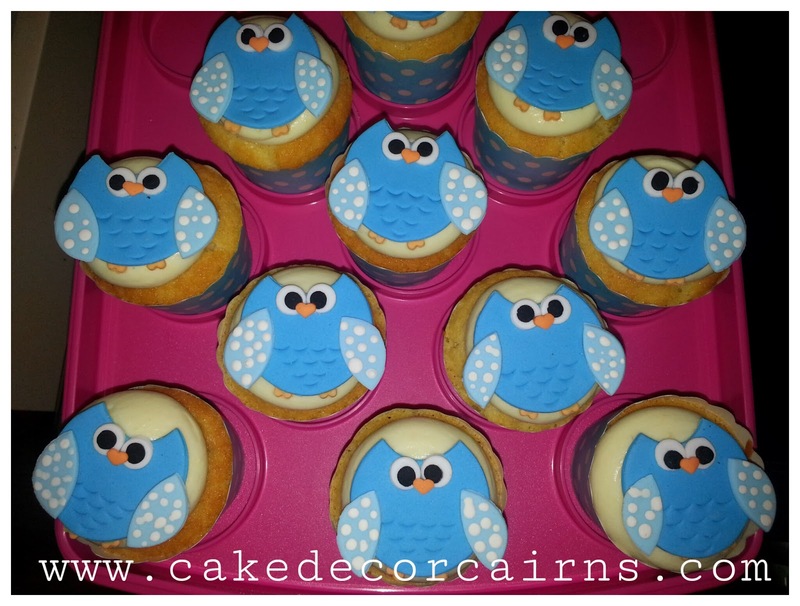 My Do it yourself Owl Cupcake Toppers. They can be customised in any colour theme to suit your occasion. What do you think?